The leaves are the parts that are used in herbal medicine from Lemon Balm; a bushy, leafy herb that grows prolifically in diverse climates and is well known for its fresh, distinctive aroma. 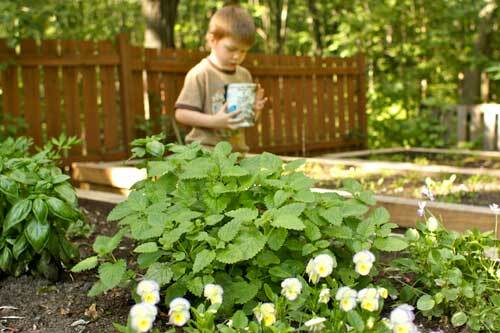 Lemon Balm has been extremely popular in all the old European traditional medicine systems. 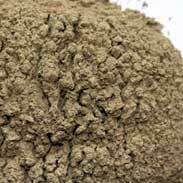 It has been seen to be equally beneficial to digestive disorders as it is helpful to conditions involving the nerves. Traditional uses include migraines, headaches, stomach cramps, urinary infections, feverishness in children, shingles, vaccine reactions and sleeplessness. Children seem to respond particularly well to Lemon Balm tea when they are anxious, upset or they are experiencing internal pain. Lemon Balm has been used as a traditional treatment for overactive thyroid conditions. 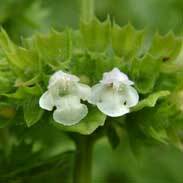 400 hundred years ago, the English herbal physician John Evelyn wrote “Lemon Balm is sovereign for the brain. It strengthens the memory and powerfully chases away melancholy”. Culpeper said "Let a syrup be made of the juice of it and sugar and let it be kept in every gentlewoman's house as it hath so much purging quality in it as to expel those melancholy vapours from the spirits and blood which are in the heart and arteries"
Lemon balm was apparently the favourite herb of the mad genius Paracelsus who believed it would 'revivify a man'. It was also the subject of some extraordinary visions of Saint Hildegard, who said that Lemon balm came to her in a vision and she saw that it had seven different ‘faces’ or personalities, with the centre of them at the heart. The British Herbal Pharmacopoeia (BHP) describes the actions of Lemon Balm as 'carminative, antispasmodic, diaphoretic & sedative'. It says it is indicated for 'flatulent dyspepsia, neurasthenia & depressive illness and that it is 'specifically indicated for dyspepsia associated with anxiety or depressive states'. 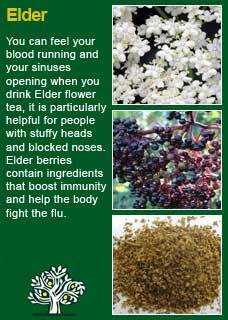 The BHP suggests combining it with Hops and Meadowsweet for gastric dyspepsia and recommends a dose of 2-4 grams or by infusion and the tincture at 1:5 in 45% ethanol at a dose of 2-6 mls daily. In times gone by Lemon balm was a great favourite for all complaints believed to proceed from a disordered nervous system. The London Dispensatory (1696) wrote 'an essence of Balm every morning, will renew youth, strengthen the brain and relieve a languishing nature'. The great 10th century Arab physician Avicenna wrote 'Balm causeth the heart and mind to become merry' and in Europe for many centuries it was a common adage that Balm 'will 'comfort the heart and drive away melancholy'. 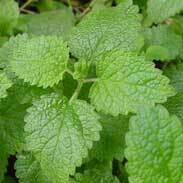 In even earlier times Lemon balm was widely used as a healing herb for wounds and skin diseases. 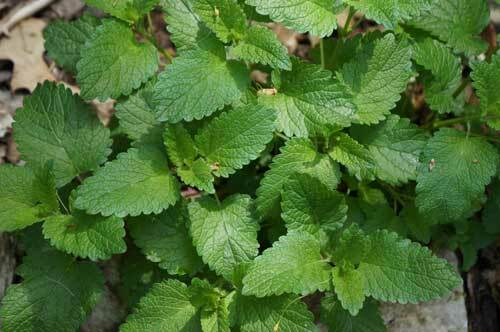 The ancient Greek physician Dioscorides recommended to put Lemon balm leaves on skin wounds and the Roman physician Pliny highly regarded its ability to help stop bleeding. ~ There are a number of further clinical trials with people taking herbal formulae that included Lemon balm. These studies showed positive results for dyspepsia, colic, sleeplessness and anxiety but they all had the Lemon balm as part of a formula with other herbs. Whilst this means it's difficult to be precise about scientific tests of Lemon balm by itself it does illustrate what herbalists from ancient times knew as well; that this is a herb that well-potentiates the actions of other herbs. No adverse effects are expected from taking Lemon balm, even in high or frequent doses. It may be confidently taken during pregnancy or whilst breastfeeding (there may be a mild relaxing effect on the baby as the essential oil of Lemon Balm will pass through the breast milk) and it can be used by the young or old with safety. Theoretically, Lemon Balm may alter thyroid function, reduce thyroid hormone levels, and interfere with thyroid hormone-replacement therapy. However, note that, as a common and popular herb, Lemon Balm has been used extensively and frequently with no historical cautions or reported adverse reactions in this regard and, if there is an inhibitory effect on thyroid hormone production, it is likely to be mild and dose-dependent. 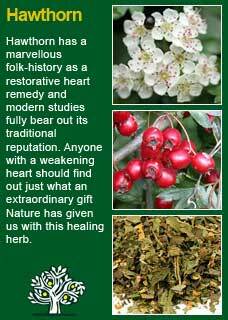 For the right person Lemon balm can have a marvellously healing effect. It calms and soothes in such a gentle but sure way; watching it melt away a person's tension is like seeing someone who has become chilled put a warm cloak around them. If you who are reading this are studying herbal medicine or have your own reasons to want to understand this plant ally at a much deeper level then I urge you to take a dose of Lemon Balm tincture or a cup of its tea and then, with a quiet and attentive mind, observe how the herb makes you feel. This ancient method is how people have always understood the action of a herb in an experiential way and it can give an appreciation that transcends a purely abstract knowledge of these medicines. A person has to try this for themselves for it to really make sense but speaking for myself when I do this I feel Lemon Balm going straight to my heart! It is very relaxing and soothing, truly a gentle remedy and surely one that can only do good to a person. I use a lot of Lemon balm in formulas of both dried herbs and liquid extract formulas. I often use Lemon balm in a similar way to how I use Licorice root in that I think Lemon balm helps to harmonise the formula, as well as making it taste better and be better absorbed. Fresh Lemon Balm tea, made with a few leaves from the garden in a cup of hot water is calming and refreshing. Fresh Lemon Balm tincture (where you make the extract without drying the herb first) is vibrantly green and uplifting. Both dried Lemon balm tea and dried Lemon balm tincture are nourishing, tonic, and well suited to longer term use. You cannot overdose with it but there is no point in taking more than you need for a therapeutic effect. In a cup of hot water a few leaves of fresh Lemon balm are ample to get its benefits. As a dried herb a teaspoon is enough for most and as a tincture just 1 or 2 mls should be more than ample for it to bring its lovely presence to the mind and body. 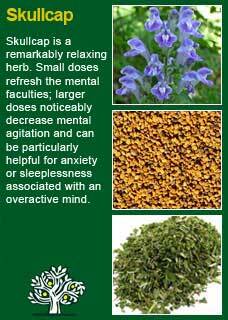 If we cannot get good fresh and vibrantly green Skullcap then we use Oatstraw instead. We can usually get all of these herbs organically these days. The recipe above shows the proportions and this amount would add up to 180gms of herbs, which is 2 or 3 two large jar-fulls. 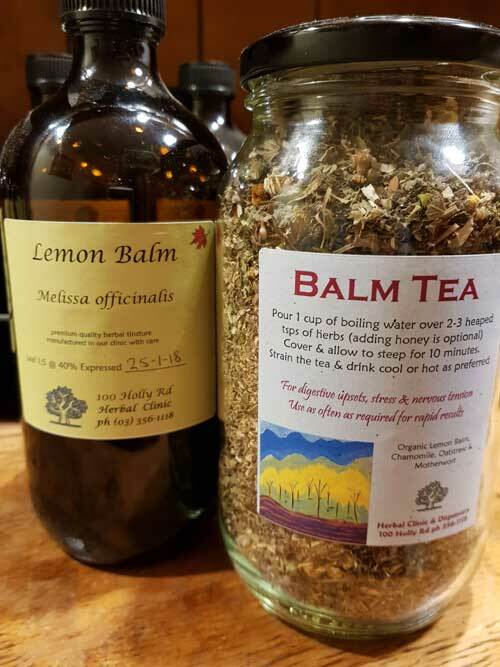 Lemon Balm combines perfectly with Skullcap for anxiety, with Elder for childhood illness and with Hawthorn for irregular and stressed heart rhythms. 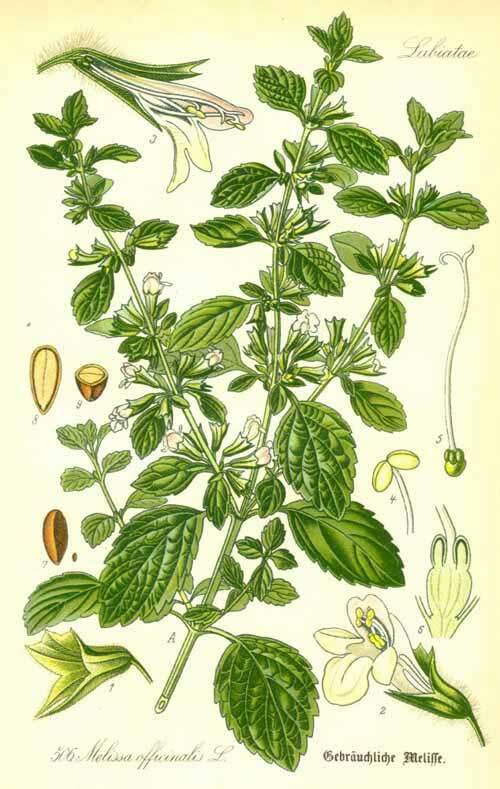 Much of the information here about the traditional uses of Lemon balm is consistent with the model of thinking whereby one may treat problem A with plant B. There is value in this approach, especially in how it helps us pass on useful knowledge to one another, but it falls short in one vital area; and that is that people are not all cut from the same cloth! Something that works brilliantly for one person may do less for another -- why is this? Anyone can enjoy and appreciate this herb but I have seen that Lemon balm may be particularly well-loved by the hotter constitutions. As a potent member of the mint family it may have some much welcome cooling benefits to an overheated head, heart or belly.